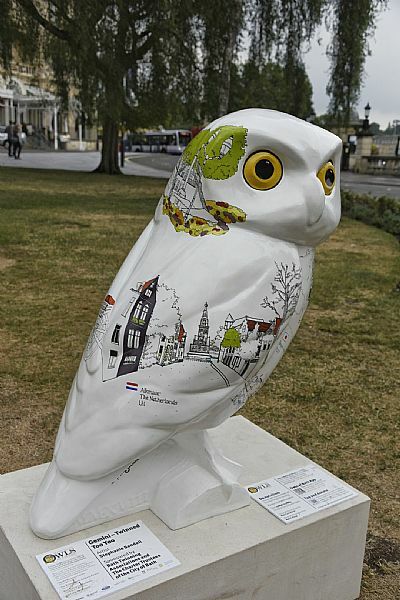 Bath's twin cities are celebrated in a special way on the Orange Grove/Alkmaar Garden in the city centre, via "Gemini", a metre tall sculpture of an Owl - or 'Uil' in Dutch. Gemini features delicate portraits of each of the twin cities, including Alkmaar's famous cheese market weighing house, and the word "owl" in each of the cities' five languages. A total of over 80 uniquely painted owls form part of an 'owl trail' around the City over this Summer. The owls will then be auctioned and all the money raised will go to local charities. 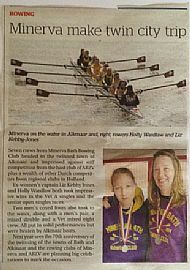 7 crews from Minerva Bath Rowing club headed to Alkmaar in April to race in the annual AA race. With stiff competition from the host club of ARZV plus a wealth of other Dutch competitors from regional clubs in Holland, Bath’s only rowing club had its work cut out but ex-women’s captain Liz Kebby Jones and Holly Wardlaw both took impressive wins in the Vet A singles and the senior open singles races. 2 men’s coxed 4s took to the water, one crew coxed by complete novice cox Ali Daw Cameron, a men’s pair, a mixed double and a Vet mixed 8 crew all putting in solid performances but beaten by stronger Alkmaar boats on the day in windy conditions with hail coming down on the start line during the first division. Senior men’s rower Andy Hoyes said “Every year crews go over to Holland and their crews come back here, we’ve been doing this for over 30 years now, it is great to see how many people from the clubs keep the connection between the cities alive. Of course the competition on the water is very real too, we had two great wins from two of the women’s squad this year so we’re pleased to bring home some medals”. The photos above show a report from the Bath Chronicle and one crew on the river. The weekend was not all about Rowing; on Saturday afternoon the English were treated to Dutch culinary delights at a cookery workshop where they made Bitterballen, a savoury Dutch meat-based snack, typically containing a mixture of beef or veal, beef broth, butter, flour for thickening, parsley, salt and pepper, resulting in a thick roux, which is shaped into balls, covered in breadcrumbs and deep fried. On Saturday evening a group of 40 friends sat down for dinner at Fabers restaurant in Alkmaar. The reception was held on Tuesday the 8th of December, in the Braunschweig Room at the Guildhall in Bath, from 5.00 p.m. to 18.30 p.m. The reception was hosted by our Mayor, Councillor William Sandry, and several Charter Trustees were present. Every Twinning Association had a small display of its activities. This was a great opportunity to meet old friends and to make some new ones! Bath Photographic Society held their popular Annual Exhibition from 17th - 21st November 2015 at Bath Central Library, The Podium, Bath, BA1 5AN. The Heilooer Amateur Fotografen (HAF) from our twinned city of Alkmaar had sent in a contribution of twenty photos for this exhibition, one of which is printed below, together with photos taken at the exhibition! 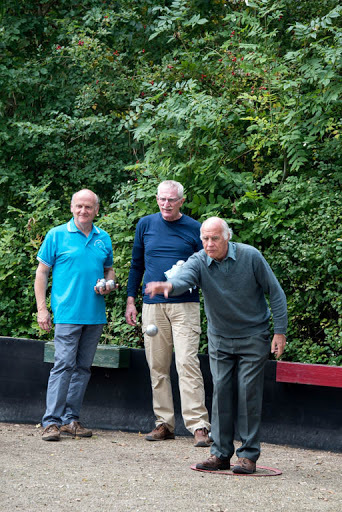 To see photos, click here..
Members of City of Bath Pétanque Club travelled to Alkmaar in North Holland in early October to meet up with fellow players at the city's 2 clubs: L'Autre Chemin and Celeritas. This was the third visit that club members had made to Bath's twinned city with a number of new members joining the trip this time. Those who had not been to Alkmaar before were bowled over by the beauty of the old houses, the canals and the market square where the famous cheese market takes place. All felt that the city deserves wider recognition as a tourist destination with some already planning return visits. Bath players took part in a mêlée competition at L'Autre Chemin where teams are made up with players from both clubs and team members change around for each game. This gave us the chance to meet up with familiar faces and meet new people. Congratulations to Dalene Robertson and Christine Cox who were among the prize winners. An early start on the Sunday saw teams of players arriving at the Celeritas Sports Complex for the Open Doubles competition along with players from other parts of Europe and the Netherlands doubles champions. Undaunted by the level of competition, Bath players enjoyed 5 rounds of games before relaxing in the late afternoon sunshine outside the clubhouse. Chris McGinn and Christine Cox won a cash prize for the team with the highest points score and 1 win. Diana Lockwood and Liz Bugg won a cash prize for the lowest points score overall! We were delighted to be presented with gifts of mature Edam cheese by the club. Members of both our host clubs were presented with City of Bath club pin badges, and we are now optimistic that players from Alkmaar will come to Bath for one of the Club's open competitions in 2016 and to give us the opportunity to return the warm hospitality that we always receive. During the weekend of 25 – 28 September Alkmaar's rowing club ARZV were hosted by their friends from Minerva Bath Rowing Club. On Friday evening 22 visitors from ARZV were welcomed to the City by the Right Worshipful The Mayor of Bath, Councillor William Sandry at a Civic reception held in the Mayor’s Parlour. The event was also attended by the Reverend Martin Broadbent, Chairman of the Bath – Alkmaar Twinning Association. The visitors went onto the Harrington Club for a meal and drinks before being collected by their hosts. The full programme can be seen by clicking here. This year saw the return to Bath of Bram Zwart who took part in the inaugural visit of ARZV to Bath 30 years ago, in 1985. Bram remembered being welcomed that year in the same room by the Mayor at that time and even remembered her name; Mrs Jeannette Farley Hole. Bram went on to present the Mayor with a gift from ARZV, a “Rigger Gate”, from an old rowing boat, on an engraved mount. Bram thanked the Mayor for his kind welcome and hospitality. It has been a very busy and we think, very successful year for the Bath – Alkmaar Twinning Association. We worked very hard on governance by taking on board the recommendations on the activities of our Association as presented in the report of the management consultancy Nine Feet Tall. This advice was offered free of charge by Esther McMorris, CEO of Nine Feet Tall, for which we are very grateful. Furthermore, we strengthened our Committee with several new Committee Members and we found Councillor Dine Romero willing to fill the vacant post of Vice Chairman. 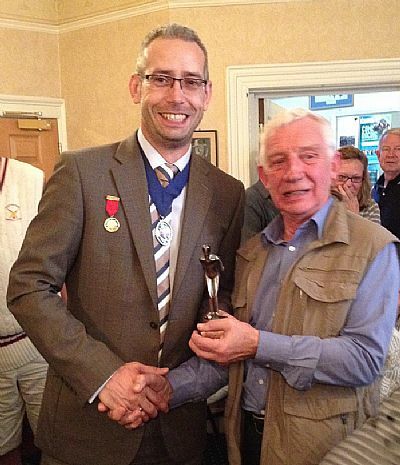 For the second year running we substantially increased the Membership of our Association and our webmaster, John Stirrup, worked very hard on our website. We found the Bath engineering company Rotork Controls Ltd. and Bath-based Charles Stanley & Co. Ltd. (Investments Service) willing to sponsor two main twinning events of our Association over the last year: the visit of the Regional Youth Orchestra ‘Artiance’ to Bath and the participation of young athletes from Bath in the 2015 International Children’s Games that were held in Alkmaar. We got additional support for these two activities from the Charter Trustees of the City of Bath, Hayesfield School and the ‘Alkmaar’s Uitwisselings Comite’. Again, we are very grateful for their support. To see in more detail, the twinning activities between Bath and Alkmaar which we organized, participated and/or supportedover the last twelve months, click here. In response to an invitation from the Grafisch Atelier Alkmaar (GAA) to become involved in their fortieth anniversary celebration - ʻGAA Druk maken 2015ʼ - three members, Emma Gregory, Sheena Vallely and Leah Crews travelled to Alkmaar in July to exchange ideas, give talks and demonstrations. For all involved it was a revelation. A basilica styled church had been transformed into a ʻcathedralʼ of printmaking. In place of pews were a variety of presses providing the foundation for demonstrations, talks and projects while works from various printmaking ateliers in the Netherlands and elsewhere lined the interior, providing examples of the power and variety of contemporary printmaking. The festival, which took place from early July to the end of August, was also a forum in which artists from different countries came to together to exchange ideas, explore possibilities and establish bonds. During their residencies Emma, Sheena and Leah embarked on projects related to Alkmaar and intend to develop these further now that they are back in Bath. This will ensure that the links established in Alkmaar will continue and hopefully flourish in the future. Their works will be shown in the GAA Gallery in Alkmaar during 2016. They and all at BAP therefore would like to thank the team from GAA, members of the Alkmaar Twinning Committee, which supported the visit with a grant, and all the volunteers who were a constant source of generosity, enthusiasm and inspiration. They will not be forgotten. In this fourth report to our twin cities I’m going to tell you about a project that has happened recently. This was a partnership project with local organisation ‘A Word in Your Ear’, with whom we’ve now worked in partnership with a number of times, and crafts expert Emily Langdon. It gained a small grant from Bath and N.E. Somerset Council Arts Development Funding. The idea was to encourage people to recover and write down memories particularly those associated with textiles. These memories written on ‘quilt patch’ shaped paper are now being sewn into a large paper ‘quilt’. In September 2014 Poona Badminton Club of Alkmaar came to Bath as our guests. As always with our exchange visits, Saturday afternoon was to be set aside for a badminton tournament. 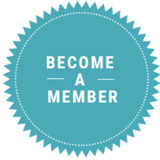 At the end of last year, Esther McMorris, founder of the Bath-based management consultancy 'Nine Feet Tall', became a member of our Association. Esther generously offered us a free consultancy on how we could improve certain aspects of our twinning activities. We gratefully accepted Esther's offer. One photo from the Heilooer Amateur Fotografen (HAF) from our twinned city of Alkmaar, together with photos taken at the exhibition! Click on photo to see larger version and click on 'back button' in browser to return to page. The 2015 International Children’s Games. Young athletes from Bath participated in the 2015 International Children's Games. Accredited by the International Olympic Committee, 18 children aged from 12 to 15 travelled to Alkmaar in the Netherlands to participate in the 49th running of this annual competition, which were held from the 24th to the 29th of June 2015. More than 1500 athletes between the ages of 12 and 15 from about 80 cities worldwide took part. They competed in track and field, golf, football, tennis, swimming, gymnastics, judo, beach volleyball and volleyball events at different locations in Alkmaar. 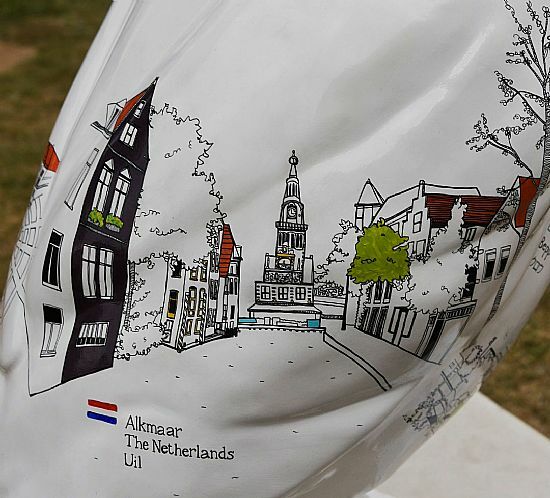 Although the City of Bath is not a member of the International Children’s Games organization, it was invited to take part in the 2015 event because of its twinning link with Alkmaar. The Charter Trustees of the City of Bath accepted this invitation and an informal working group to support the preparations of the ‘City of Bath’ team for the Games was set up. Councillor Dine Romero, our Vice Chairman, chaired the working group. The ‘City of Bath’ team was 24 people strong: 18 athletes, four coaches, a ‘Head of Delegation’ (Councillor Dine Romero) and last but not least a City Representative, Councillor Will Sandry, current Mayor of Bath. Beechen Cliff School, Hayesfield School, Bath Dolphin Swimming Club and Bath University Team Bath Judo Club sent athletes and coaches. The ‘City of Bath’ team competed successfully in girl’s soccer, tennis, swimming and judo. Yearly Twinning Association Pétanque Match. On the evening of t he 26th of June, Bath's four Twinning Associations came head to head in Queen Square once again for a Pétanque tournament organized by the City of Bath Pétanque Club. Competitors were relieved to find that the rain stopped at the right moment for play to begin on time. Last year's winners, the Bath - Alkmaar Twinning Association (! ), met with strong competition from the Kaposvár teams, who won 5 out of 6 games to become this year's winners. The then Deputy Mayor, Councillor Shaun McGall, presented Peter Metcalf, Chair of the Bath - Kaposvár Twinning Association with the trophy. The Alkmaar Rotary Club visited the Rotary Club of Bath in May. 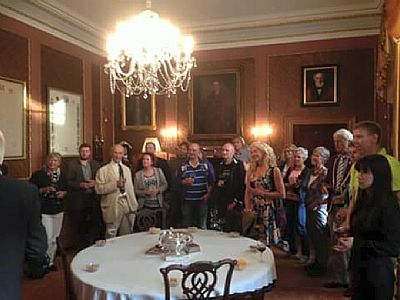 Hosted by the Rotary club of Bath, this visit by its counterpart from Alkmaar ran from the 28th of May until the 31st of May 2015. The twinning activities between the two clubs are going back to the years just after the end of the Second World War. On the Friday an outing was organized to Avebury followed by lunch in Marlborough and in the evening the guests were entertained in the homes of their hosts. The following day a Gala Evening took place at the Lansdown Golf Club, with, as per tradition, the hosts providing the entertainment. It was a great weekend and friendships were renewed and new ones made! The visit of the Regional Youth Orchestra ‘Artiance’. The playing of Alkmaar Regional Youth Orchestra, from our twin city in the Netherlands, delighted Bath audiences at two concerts on the 1st and 2nd of May 2015. The 68 Dutch musicians, aged between 10 and 18 years old, played on the Friday evening at Hayesfield School where the school’s senior choir joined them. The concert ended with the audience of all ages together with the orchestra and choir giving a hearty rendition of Edward Elgar’s ‘Land of Hope and Glory’, the young musicians later socializing and singing together with no noticeable language barrier. 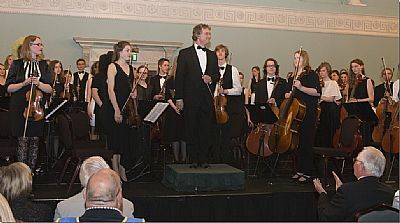 Saturday’s concert took place in the glittering surroundings of Bath’s Assembly Rooms in the presence of the then Mayor of Bath, Councillor Cherry Beath. Once again the young musicians, playing under the inspired leadership of their conductor Otto de Jong, performed with a maturity and precision that belied their years and impressed all who attended. The orchestra’s visit was organized to celebrate 70 years since links were first forged between the two cities in 1945 when, through local fundraising, food and money were sent from Bath to Alkmaar helping the Dutch city in the last year of the war when people were dying of starvation. Following the success of this musical weekend plans are already in hand to continue the links between schoolchildren in Bath and Alkmaar. Minerva Bath Rowing Club from Bath wins back the Challenge Shield. Minerva Bath Rowing Club won back the Challenge Shield on their annual trip to Bath's twin city Alkmaar. 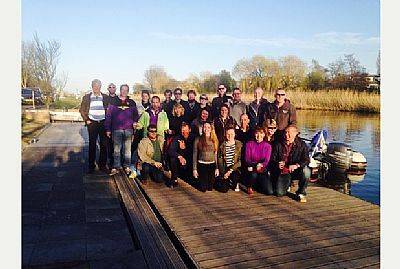 Rowers from Bath spent three days in April 2015, taking in Dutch culture before Sunday's races against the ‘Alkmaarse Roei en Zeil Vereniging (ARZV)’. Annual exhibition of the Bath Photographic Society. 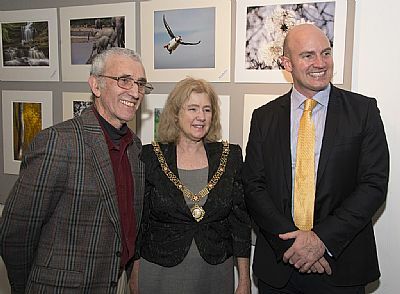 The society staged its annual exhibition from the 18th to the 22nd of November 2014 at Bath Central Library. This year twenty digital images were provided by the ‘Heilooër Amateur Fotografen (HAF)’. Heiloo is a village, 5 km south of Alkmaar. Bath-based London Camera Exchange sponsored the exhibition. 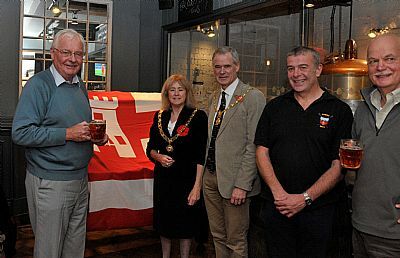 The (then) Mayor of Bath, Councillor Cherry Beath, joined the many Bathonians who have gained insight into the city’s twinning activities through the monthly Alkmaar Café. 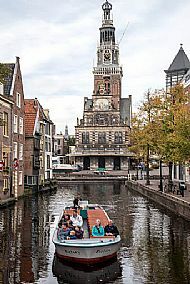 Organized by the Bath - Alkmaar Twinning Association, the Alkmaar Café gives those interested in the Dutch twin city and twinning in general the opportunity to meet in an informal setting and learn more about the links that exist between Bath and Alkmaar. At the November Alkmaar Café, the then Mayor and her Consort, husband Richard, tasted cheese brought for the occasion directly from the world renowned Alkmaar Cheese Market. The Mayor expressed herself delighted to meet members of the Bath - Alkmaar Twinning Association and that the occasion brought back memories of her staying in the Netherlands. The photograph shows the (then) Mayor of Bath, Councillor Cherry Beath, at the November Alkmaar Café with her Consort and members of the Bath - Alkmaar Twinning Association, including on the left the Chairman Martin Broadbent. In the background is the flag of the city of Alkmaar. The Bath - Alkmaar Twinning Committee sometimes helps to achieve wonderful results. Recently Mrs. Janice Wareham from Bath wrote to ask if we could help her. She was a child during the Second World War and remembers a visit soon after the war ended. A group of children from Alkmaar came to Bath and were hosted by families in the city. Her family looked after a boy called Theo van Hilten. Could the Bath – Alkmaar Twinning Association help her discover whether or not Theo was still alive and find out if he would like to renew contact after all these years? Happily we have been able to put them in touch once again and a friendship, which was started about 70 years ago, has been renewed. It is a wonderful story, which emphasizes that it has been a very successful year indeed! So what is being planned for the next twelve months? It promises to be just as busy as last year, if not more so! Foremost, we would like to see a stronger involvement of the Charter Trustees of the City of Bath with twinning. We would also like to see a further increase in our membership - more members means more possibilities to support twinning activities. In addition we would like to focus more on support for children of a less privileged background who would want to take part in a twinning activity. This means that we will look into how we can build on the visit to Bath of the Regional Youth Orchestra ‘Artiance’ and how we can assist with the possible involvement of young athletes of Bath in the International Children’s Games. Secondly, we want to further develop links between schools in Bath and schools in Alkmaar and organize ‘themed’ sessions (for named groups) of the Alkmaar Café (held every first Tuesday of the month from 18.00 to 19.00 at the Bath Brew House). Lastly, we like to look into possible twinning activities for football, cycling and museums. This is all hard work and we acknowledge that publicity is key. Therefor, we are very keen to recruit a publicity officer for the Committee of the Bath – Alkmaar Twinning Association. In more detail, the following twinning activities are as of August 2015 planned for the next twelve months. A visit of the Bath Artist Printmakers to Alkmaar on the occasion of the 40th anniversary of the ‘Grafisch Atalier Alkmaar’. They will participate in an exhibition in the ‘Grote Sint Laurens Kerk’ (10th of July to the 31st of August 2015). A visit of the ‘Alkmaarse Roei en Zeil Vereniging (ARZV)’ to Bath. This visit is hosted by the Minerva Bath Rowing Club (25th to the 28th of September 2015). A visit of the Bath Pétanque Club to Alkmaar, hosted by the L’Autre Chemin Club and Celeritas Club. They will play the L'Autre Chemin Club on the Saturday and compete in the Celeritas Club Open Competition on Sunday (2nd to the 6th of October 2015). Participation of ‘Heiloo’s Amateur Fotografenvereniging (HAF)’ in the yearly exhibition of the Bath Photographic Society (BFS) running in Bath in November 2015. Develop twinning activities between the NHSRF Bath & District Branch and/or RUH NHS Foundation Trust in Bath and the ‘Alkmaar Medisch Centrum’ in Alkmaar. Visit of ‘De Alkmaarse Waterratten (DAW)’ of Alkmaar to Bath, hosted by the Bath Dolphin Swimming Club (Easter 2016). And, last but not least, an Alkmaar Café session at the Bath Brew House every first Tuesday of the month from 18.00 to 19.00. We hope to meet you there! At the end of September, Alkmaar Rowing Club (ARZV Roei), visited Bath and took part in the Monmouth Autumn Head of the River 2015. Just because you are special to Bath and us! Bath and find somewhere to have lunch in smaller groups. Where we can try to wreck your Sunday performance with Beer, Wine and Spicy food. in the cellar to say a fond farewell after a good day’s racing at Monmouth. fool of yourself during the weekend’. 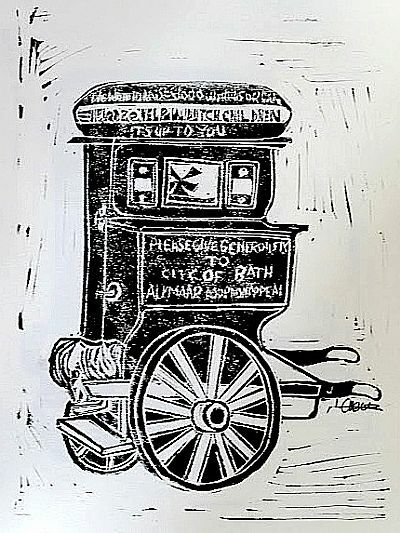 Leah Crews, ʻThe Bath Barrel Organʼ, Linocut. Leahʼs work centred on the story of how the twinning between our two cities came about. The barrel organ, now in the Alkmaar town hall, was played in the streets of Bath shortly after the second world war to raise funds for the orphaned children of Alkmaar. She now proposes to produce a print of the Alkmaar Gardens in Bath, copies of which will be sent as gifts to the Twinning Committee in Alkmaar. 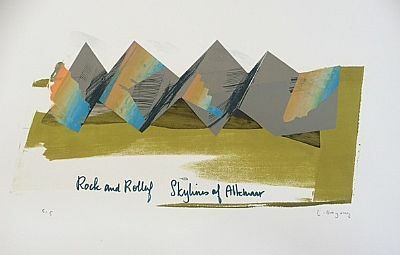 Emma Gregory, ʻSkylines of Alkmaarʼ, Silkscreen. Sheena Vallely at work in the Grote Kirk. During her residency Sheena was introduced to several dutch artists, one of whom collaborated with her on a new work inspired by her visit. The two plan to meet later this month in Bristol. Greetings to our four twin cities (Kaposvar, Braunschweig, Alkmaar and Aix-en-Provence) from Bath Library! Clare Reddaway (from a Word in Your Ear’) and I also ran a Saturday writing workshop to inspire people to write short stories inspired by a range of patterned textiles and also a family quilt brought in by Clare. Emily Langdon had a three day residency in Bath Central Library gathering memories from library users and showing them how to hand sew patches. She also had her sewing machine with her in the library! being assembled by hand stitching. during her three day residency. The quilt of memories is a work in progress and not yet completed. I hope you’ve enjoyed hearing about this project and I will send out my next update at the beginning of July. Best wishes from all of us at Bath and N.E. Somerset Library Service. In this third report to our twin cities I’m going to tell you about a ‘community library’ that we run in a rural part of Bath and N.E. Somerset. This library is very unusual as it is in a public house called the ‘Stoke Inn’. It has a very small collection of books which local people can come and borrow. They just have to sign in a notebook to say that they have borrowed a book. We have some local people who volunteer to look after the books. They come in on a rota basis on Wednesday mornings. We work with some other organisations to run events and opportunities in the ‘library’ as well and the library is known as the ‘Hub-in-a-Pub’ and has its own logo as you can see below. I run a regular monthly reading group and a Creative Writing Group. We’ve also provided a course in Family History and advice on how to download e- library books. Every year Bath has a Literature Festival and the Producer from the Literature Festival came out to run a special session of the reading group this month in the ‘Hub-in-Pub’ library. This is a really worthwhile project as it is greatly appreciated by the local people, many of whom feel cut off from the city. We hope you enjoyed hearing about this project. I’ll send our next update at the beginning of April. In this second report to out twin cities I’m going to tell you about a short story writing competition that we’ve just organised. This competition was for adults and we ran it in partnership with an independent organisation based in Bath called ‘Story Fridays’. The competition also had sponsorship from The Bath Chronicle (the local newspaper). Entrants were asked to write a story on the theme of ‘Noir’. We had lots of entries of very high standard and were able to give certificates and book token prizes to six winners. The winning six stories were read at a ‘Story Fridays’ event at a venue called Burdall’s Yard (owned by Bath Spa University, which is used for arts performances). The event was held on Friday 7th November at 7pm. The stories (some read by the authors and some by actors) were all very enjoyable to listen to. a story winner co-reads her winning entry. I gave a short speech and presented the certificates and prizes. There were between 50 and 100 people present and it was a great evening. The readings were followed by the screening of a classic Noir film The Third Man and the evening finished at 11.30pm. We hope you enjoyed hearing about this project. I’ll send our next update at the beginning of February. In 2014 Poona Badminton Club of Alkmaar came to Bath as our guests. Although the visit was very brief, from 18th to 21st of September, our initial planning meeting took place back in January. Firstly, we had to identify which of our members would act as hosts for the long weekend. Then we had to find some interesting places to visit, this was made more difficult because it was to be their eighth visit to Bath and we always like to include something new. As always with our exchange visits, Saturday afternoon was to be set aside for a badminton tournament. Eventually, we decided to do a walking tour of Widcombe taking in the Perrymead Cemetery, the locks and the architecture on Friday morning. And in the afternoon we chose to visit the premises of Aquaglass in Walcott Street. This was a good choice as it was a chance to join the Dutch in a spot of glass blowing. Everyone managed to blow their own keepsake glass bauble and we had ordered a special glass vase as a gift from our club to Poona. This was inscribed to mark the 25th anniversary of these exchanges and presented to our Dutch guests. After we finished at Aquaglass, we made our way to the Mayor’s Parlour where we had an audience with the Mayor. The tournament went well with victory this year to Bath. During Saturday we were joined by a Dutch couple who now live in South Wales, making the grand total of 14 Dutch and 32 locals who were involved in the various activities during the weekend. On Sunday we concluded our weekend en-route to the Airport at Banwell Bone Caves. Here we saw some fascinating glacial bone deposits and took the opportunity to climb the 50ft tower on Banwell Hill, with views over the Severn estuary. The consultancy took place at the end of last year and during the first quarter of this year and was carried out by Tegan Allen. A report, titled 'The Twinning Association of Bath - Alkmaar: Best Practice research and recommendations' was produced and send to us early this summer. Subsequently, the recommendations that form part of the report, were discussed by the Committee of the Bath - Alkmaar Twinning Association at a Special Committee Meeting on 4 November. The actions that followed from this discussion will be carried over to the next Committee Meeting later this month, where Members can also have their say (a calling note for this meeting will be send out shortly). For those among you who are interested in the report from Nine Feet Tall: it has been uploaded onto our website ( www.bath-alkmaar.eu ) and can be found under the tab 'Forms & Documents'. It has also been sent for information to the other Bath Twinning Associations. As said before, we are very thankful for the assistance that was offered to us by Nine Feet Tall and in particular by Esther McMorris and Tegan Allen.